The construction of P&B Weir Electrical Cluster bars and Terminal plates is of a robust nature and will withstand a reasonable amount of rough handling. 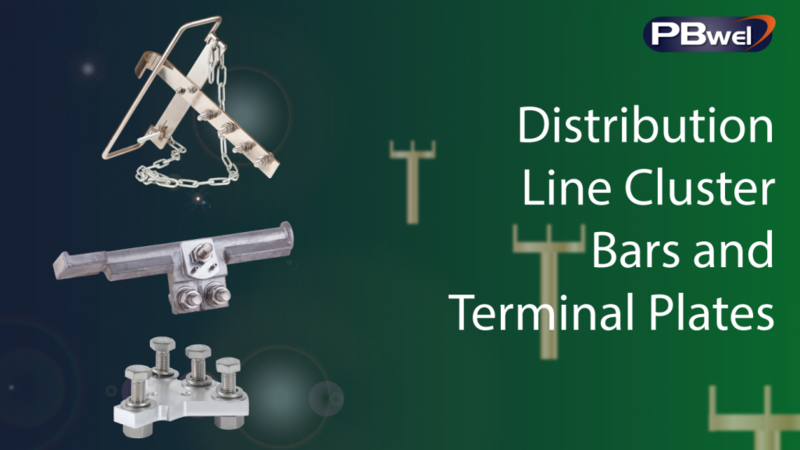 The following products are a representation of our distribution line cluster bars and Terminal plates. The cluster bar is an attachment bolted to the centre of 3 conductor clamps and facilitates the parking of the other two conductor clamps with interconnecting leads, whilst the assembly is fitted or removed from the distribution line. Type EFD-16748 is suitable for an additional cross arm clamp. Multi Point aluminium plate for interconnecting phase to clamp leads and down leads. Type A is also available with a hook. Product No: EFD-16737 with ratchet strap. Multi point aluminium alloy connecting plate. Supplied with 1 meter long pole mounting strap and a quick action carabina hook. Aluminium alloy crucifix/junction plate similar to the Type A terminal plate, with a ratchet strap for secure pole mounting.